Arriving at 7pm, we had a good hour for mingling and some drinks before dinner. For a bit of fun, Russian Revels had hired actors (who doubled as waiters later) to go into ‘Soviet’ character and engage with the guests. Some of the acting was a bit dubious but the spirit of the evening was all good fun. There was also a cabaret violinist that performed a fairly entertaining solo act after the meal. And the fact that most guests made an effort to dress up really helped to set the tone of the evening. 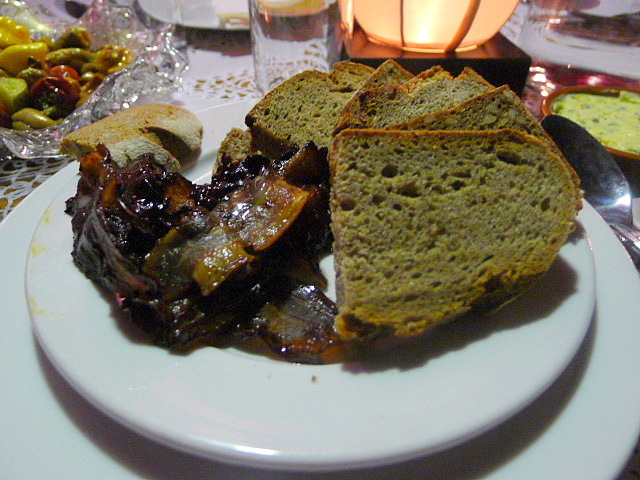 The menu had a seasonal spring focus and for zakuski (Russian hors d’oeuvres) there were ‘gilded’ pickles, rye breads with parsley and foraged dandelion butter, and some home made organic bacon caramelised with buckwheat honey. The pickles were tasty and the pickling was gentle and well judged for its acidity. The breads were delicious and I thought the choice of butter to be very original. However, the bacon didn’t quite work as the flavour wasn’t quite mature enough. 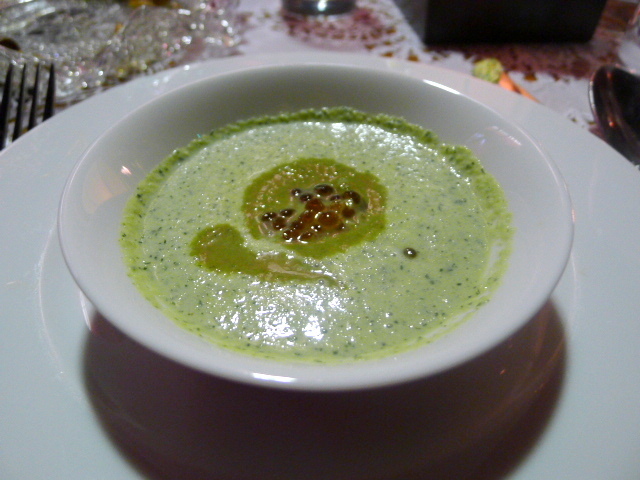 Next up was a cold cucumber and sorrel soup with pink salmon caviar. It was interesting, but not quite to my taste as it had quite a strong flavour. Next was a selection of items to be eaten together including an “arancini”, so named as it resembled the Italian version in construction and shape. It had been made with rye grain, and was delicious and hearty. It was served cold, but would have worked better had it been hot. 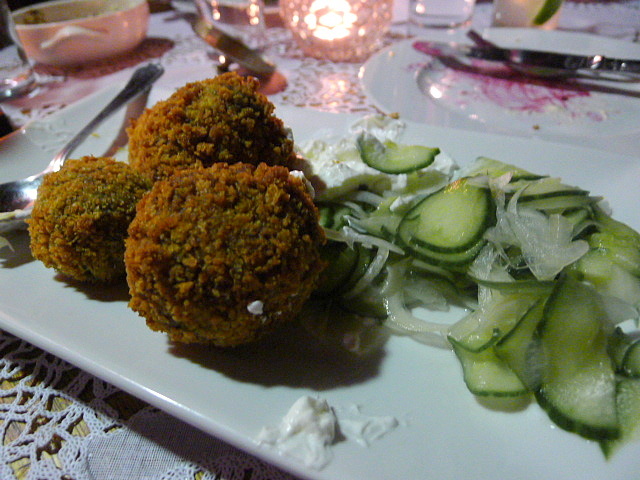 Nevertheless it was still scrumptious and served with were some lovely sweet pickled cucumbers. Alongside the arancini was a beetroot salad and an ‘allotment’. 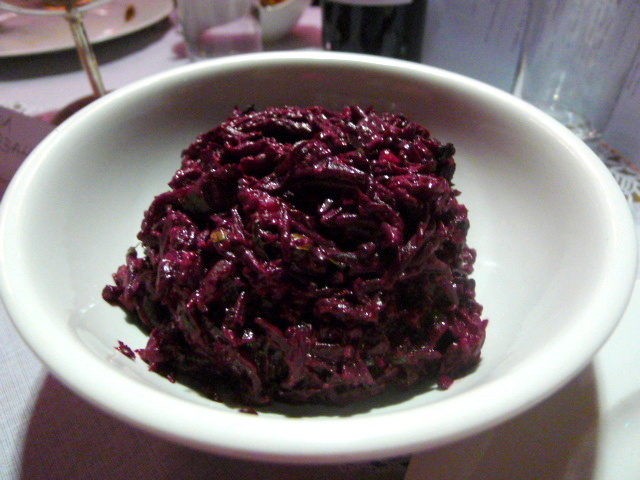 A beetroot salad is a quintessential part of a Russian table and the one served this evening was exquisite with the salad gently being sweetened with prunes, a touch that really worked. The fine chopping of the beetroot gave the salad a good texture, and its cooking had been well judged for doneness. There were some walnuts running through the salad for crunchiness, although more walnuts would have worked better. Allotments are a big part of Russian life, and the allotment here consisted of a variety of vegetables perched on ‘rye soil’, a mayonnaise topped with some toasted crushed rye bread. 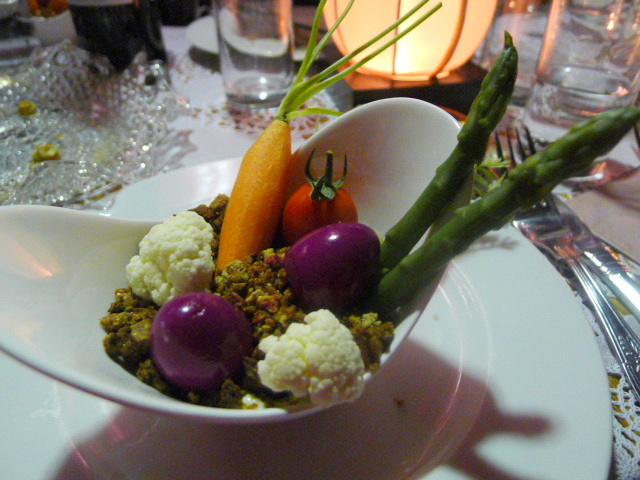 The vegetables were fresh and tasty. 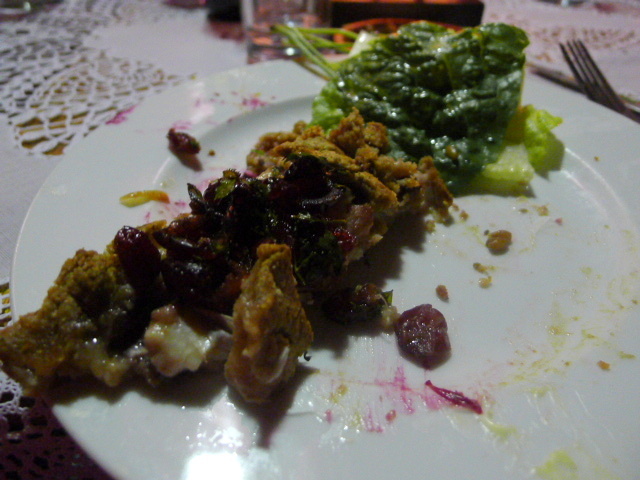 The main course was a Cornish cod cooked in a cognac-soaked rye blanket with cranberries. A take on an old Russian recipe, this dish was a disappointment. The fish was dished at the table and it looked messy. Also the portion of fish was tiny and stingy, with the amount of fish measuring about 1/3 the palm of my hand. The cod was rather bland, and the rye crumb added little flavour. The fish was served with a green seasonal salad. 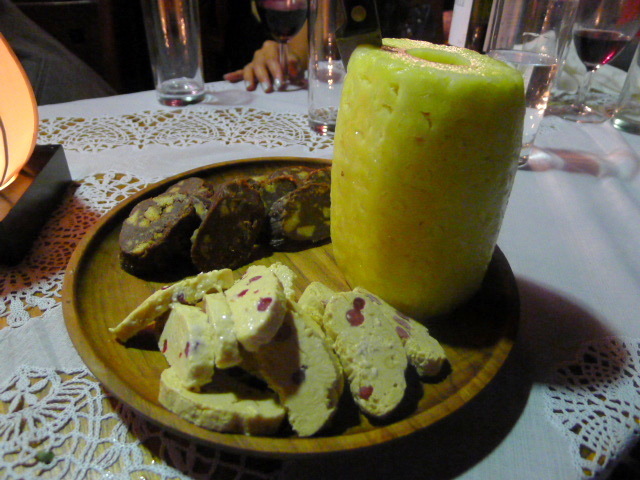 For dessert, we had a sweet charcuterie platter that consisted of chocolate salami, 12 hour ‘baked and frozen’ milk truffles, and a ‘bourgeois’ pineapple. The chocolate is allegedly a favourite of most Soviet children and it had crunchy biscuits running through it that gave it a great texture. The milk truffles, made by slowly reducing milk for twelve hours and then adding honey before freezing, were less pleasing as they was quite dense in milk flavour. This evening was pretty good fun, and it’s always nice to get a chance to dress up. 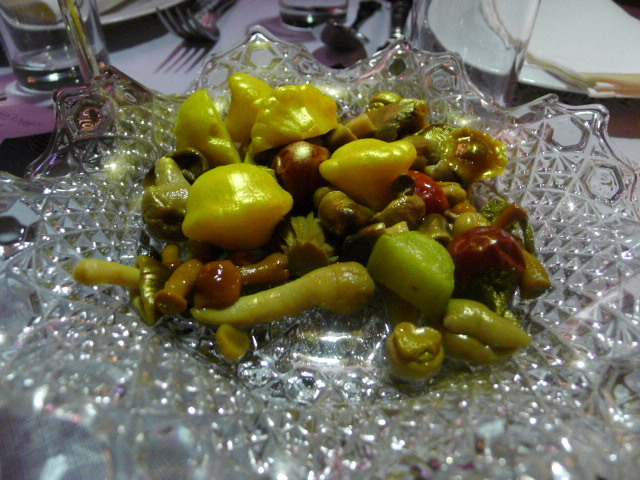 On the whole the food was really enjoyable, and the beetroot was exemplary. However the fish was disappointing, especially for something that was meant to be the star of the show. For the £45 price tag, I would have liked more substance to the meal, for example a bit more fish, some meat, etc, to make the pricing feel more justifiable. As it was, the menu was predominantly vegetarian. That said, some of the money understandably had to go towards the entertainment, so in the round, I understand the price tag. Drinks were available for purchase in cash. 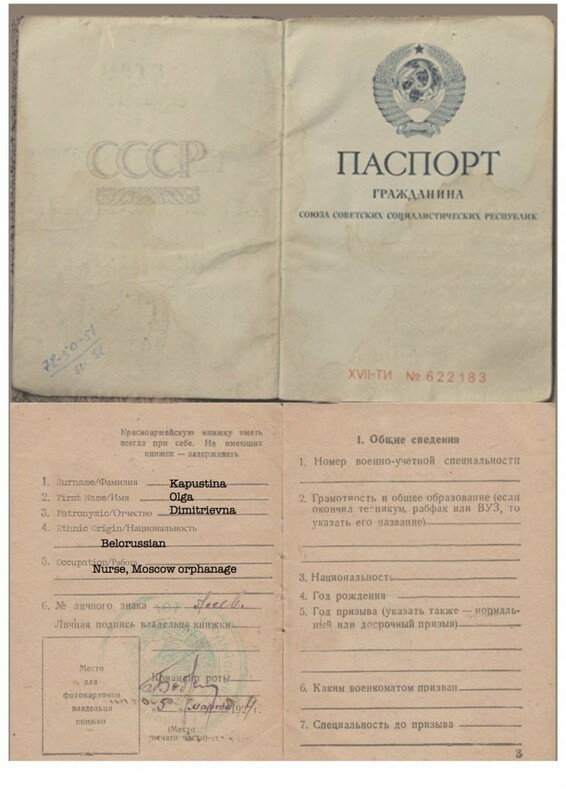 The Secret Soviet Suppers run between 18 May and 8 June 2013. Yes definitely an interesting evening!